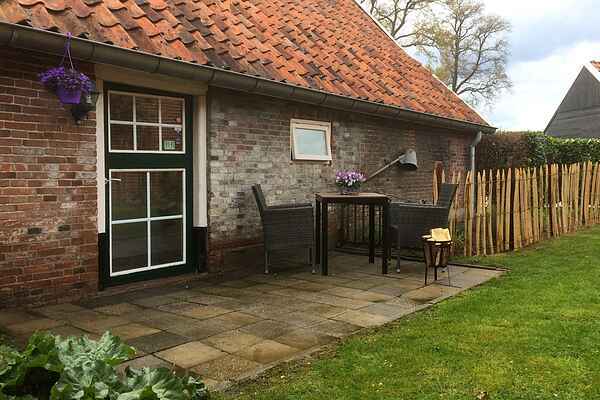 This charming and authentic holiday home is situated by a farmhouse from 1793, at the edge of the little village of Aalten in Gelderland. The farm is no longer in operation. With the woodstove in the timber-frame living room, you can look forward to a wonderful, warm and relaxed stay. The holiday house's terrace and garden offer complete privacy. You can even harvest fresh vegetables from the kitchen garden. This little house makes the perfect base for a holiday full of delightful walks and bike rides. There are many bicycle routes you can follow to discover the most beautiful spots in the Achterhoek. Explore the centre of Aalten or the area's natural beauty. Wine lovers will definitely enjoy a visit to Wijngoed de Hennepe. You can sample various wines as you tour the vineyard here. In addition to the wines from this estate, the Achterhoek offers many other regional products, all of which are worth sampling. And Aalten is just a stone's throw from the German border, so a daytrip to Germany is another possible excursion. The city centre of Arnhem is just an hour's drive away, so you can enjoy a day of shopping or other activities. The Winterswijk outdoor area is superb for cycling or walking, the small towns like Corle and Woold have good cycling paths and you will pass beautiful farms such as the Roerdinkhof. Bredevoort has traditionally been a city (has city rights) and is especially for culture and art-loving people a pleasure to be. Restaurant Bertram has an excellent map and is a fine place with its medieval Interior. You can visit the Aaltense museums in Aalten, often there are exhibitions or, for example, you can follow the Gangeskesroute through the village. Aalten has a wide range of shops and restaurants, you can relax at one of the outdoor cafes! In the summer months there are 5 Aalten days (always on Thursday). For the athlete, runner or biker the Achterhoek region is the place to be for a round of jogging or mountain biking. In the autumn-winter months you can enjoy the color beauty of nature, a visit to the nearby Christmas markets in Germany are worth it. You can order by us a nice breakfast , and use the bathrobes and enjoy the fire of the wooden stove. Come and be surprised by the beauty of the Achterhoek!